I’m glad to report that The Cure For Chaos Theory is progressing well, even though such progress never as quickly or as smoothly as I’d like it to. Personal life and other projects always seem to conspire to take me out of the studio. Even so, as of tonight there are eleven songs that are complete (apart from the final mixing and mastering), with another nine in various states of progress from early scratch track to full demo recording. 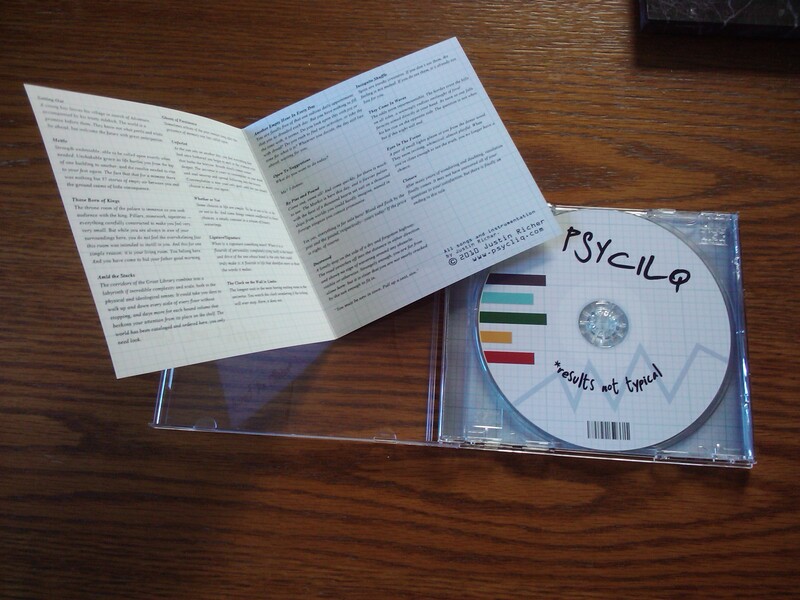 There’s still a long way to go, I admit, but we’re still hoping to have things out by the end of 2013, so don’t cross Psycliq off of your Christmas list quite yet. And in the mean time, there are some other cool things happening that you’ll like. Probably. Keep listening. I still function! Though with the month I’ve had, that’s somewhat surprising. I did manage to get into the studio long enough to lay down some ideas on a couple of songs for the next album. I like where things are going so far, and there’s still a lot of potential to be had. I haven’t really begun recording in earnest yet, and with the holiday season soon upon us I won’t likely dive into full production mode until the new year has landed. With that in mind, I’m currently thinking I’ll be able to have the new full album in your hands sometime mid to late next year. If you want to be among the first to hear about it, sign up for the newsletter mailing list! I’ll announce behind-the-scenes plans there before anywhere else. Although I am definitely open to suggestions. Want to vote? Comment here or on Facebook, tweet at us, send an email, or dispatch a courier pigeon to a predetermined set of coordinates with your desires inscribed upon it. But however you do it, let us know what you want for Christmas from Psycliq, and we’ll do what we can to get it to you! I’ve been hard at work on a cover of “House of the Rising Sun” over the past couple weeks. I’m using it as an opportunity to find my way around new software and equipment, and to try out some new ways of working with what I’d had already. One really big change? No programmed drums on this track. They’re still synth generated, but I played the whole rhythm section on the MPD18 drum pad controller. The results are a lot more organic than usual, with a lot more variation in dynamics. I’m sure I’ll gravitate back towards at least a few programmed loops, but this has been a really interesting experience. Granted, the fact that the song is in 6/8 helped push that decision, but it’s still been good. I’ve also been figuring out how to mix using the nanoKontrol2, and it’s already been a great upgrade to its predecessor. The physical control over volume sliders is actually making me use the volume automation a lot more than I used to, and doing things by ear instead of by what was easy to set up. 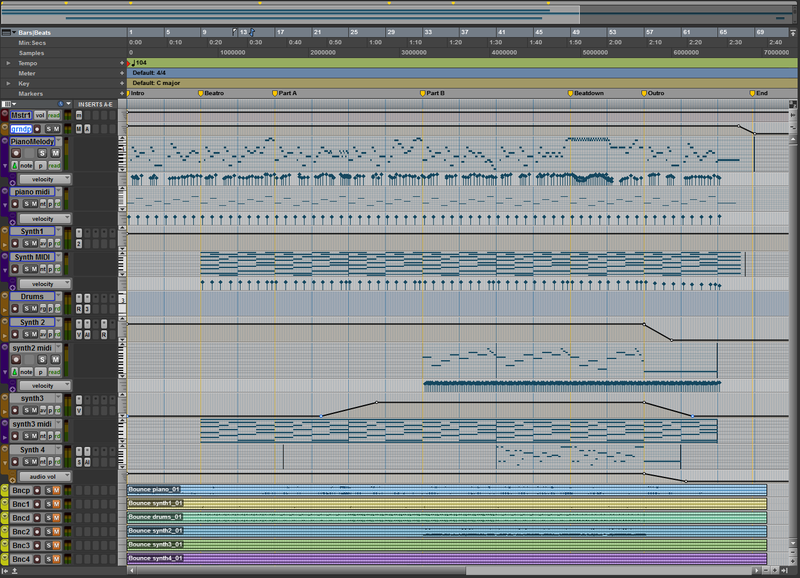 The song itself is really starting to come along, and I’m excited about the arrangement. I’m hoping to have it wrapped up sometime in mid August if all goes well. Subscribers to the newsletter will be getting a preview cut of it in the next week. Want in on the action? Subscribe today! In case you haven’t heard, the folks over at IK Multimedia are having a pretty sweet sale right now in celebration of their 15th anniversary. Basically, buy any bit of their stuff, and you get 15% off and another product of theirs (of equal or lesser value) for absolutely free. Can’t beat that with a stick. I was in the market to update my copy of Amplitube anyway when this sale came around, so the timing was really great for me. Most of the guitars in Psycliq recordings have been piped through one version of Amplitube or another, and the new version has some great capabilities to it that I can’t wait to exercise. I picked up T-RackS 3 Deluxe as my free download, and hope to use it for better mixing and mastering of my stuff from here on in. Maybe I’ll even issue remastered versions of old tracks or something, who knows? Anyway, they make good stuff and it’s a great deal, so you should go check them out. Right after Christmas of last year, I posted about my first run in with the KORG nanoKONTROL and my adventures in getting it hooked up with ProTools. Many things have happened in the intervening seven months, but two items are of particular note here. First off, KORG came out with an updated version of the nano series, tweaking all of them in pretty good ways all around. Second, I finished graduate school, and set about to upgrade a bunch of bits of studio equipment and software as a kind of graduation present. I’ve only had it plugged in for a few minutes, but the nanoKONTROL2 is an upgrade to its predecessor in many ways. First off, it has native support of the HUI protocol, which ProTools speaks without any further configuration. Thus, you plug this guy in, fire up ProTools (or any number of other editor softwares), and you’re good to go. One of the most immediate differences is the support for the lights behind all the buttons. While the original nanoKONTROL does have lighted buttons, the hacked scene file I had to use to hook it up didn’t let the DAW light buttons up appropriately. Thus, you had no indication on your control of the state of any of your tracks, or even which tracks were selected. Withe the nanoKONTROL2, all of this comes working out of the box. The dedicated solo, mute, and record switches work exactly as you’d expect, and the transport controls all do what they should as well. There are a few new controls on this device as well. In particular, there are buttons for switching track groups (something that had to be done with a mouse with the original nanoKONTROL) and for navigating between markers in the song. Even a few minutes in and it’s already a better experience overall. I feel kinda bad about upgrading so soon after getting the original, but it’s hard to argue with such progress. I’m going to keep it around for the moment and reprogram it into a general MIDI controller, with the intent of using it in software synths, effects plugins, and things of that nature. We’ll see if it ends up being truly useful in that mode, but there are at least many good possibilities ahead. 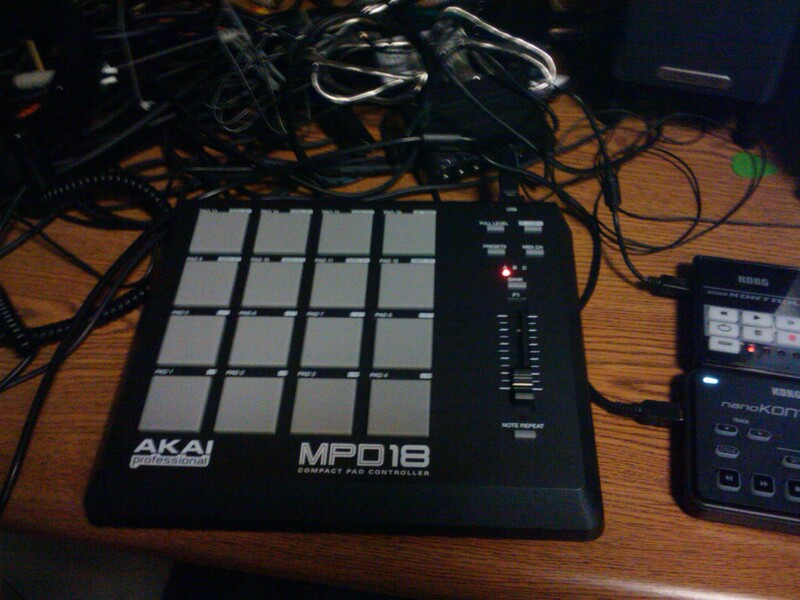 Another newcomer to the recording studio is the Akai MPD18, a 16-pad drum controller. As I understand it, this is what one uses to create Phat Beatz. Or bizzeatz. I’m not sure, really. In any case, the velocity sensitive pads on this will be much more conducive to programming drum tracks than either a mouse or a piano keyboard ever were. Since it’s just a basic MIDI controller as well, and not a drum machine in and of itself, I can also use this as a MIDI trigger for other things. Perhaps someday if I ever get up the nerve to play live, this will all come in handy. As you can see by the low-quality smartphone shots of my desk here, all of these devices leave me with about a mile and a half of USB cables strewn about, leading me to get yet another USB hub for the workstation. Several years ago, I very gladly picked up one of these guys to keep things from falling back into the oblivion behind my desk. Cordies are totally awesome. So simple of an idea, but so well executed. I haven’t yet figured out if latency is going to be an issue with all of the intervening hardware, but I guess we’ll find out soon enough. The rest of the studio upgrade is all software, most of which is still on its way. Finally able to upgrade ProTools, Reason, Melodyne, and Amplitube to their latest releases, I’ll have a shiny and full suite of new tools with which to work on new music. Oh yeah– there is new music. There is actually quite a lot of new music, and once I get all the software installed and set up, I’m going to be working on it in earnest. Keep tuned for more of that. Over the last week or so I’ve been taking some time in the evenings to do something that I should have done long ago: create per-track mixdowns of all of my released songs. This basically means getting back into ProTools and bouncing out each individual bit of audio into its own cohesive track. Here we have Adoré from halt, a somewhat complex song with several programmed synthesizer parts, a few live synthesizer parts, programmed drums, live guitars, and all kinds of effects with a good bit of automation of various parameters throughout the piece. Along the bottom of the window you can see a set of ten yellow-colored tracks with audio data that spans the whole length of the track. 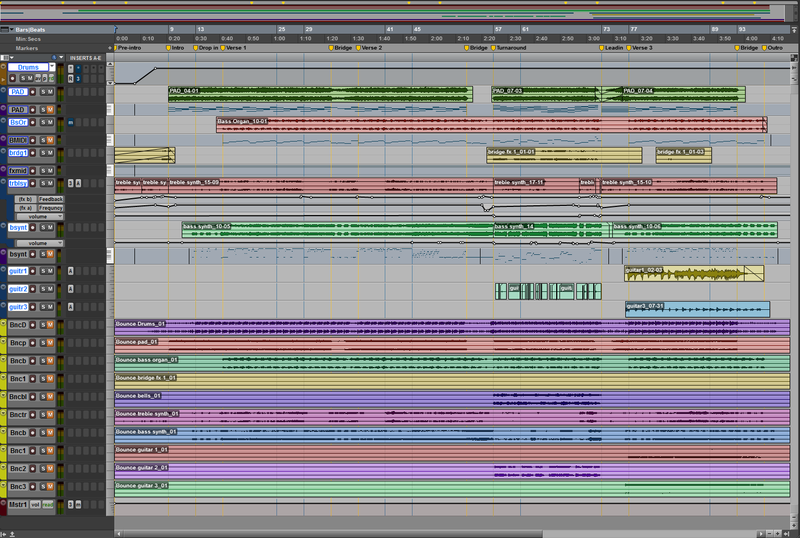 This is the bounced audio from each of the tracks above, with all the effects, automation, panning, volume, and edits applied and pushed into a single contiguous piece of audio for each track. First, figure out how many tracks you have to bounce and create that many new stereo audio tracks. You only need holder tracks for things that produce sound in your final mix — for instance, MIDI tracks themselves won’t count, but any instrument tracks that they’re attached to do count. For Adoré, there were ten distinct sound-making tracks, so I created ten new stereo audio tracks. For my own sanity’s sake, I color coded them bright yellow to distinguish them from the rest of the song and labeled all of them “Bounce [Trackname]” based on what source track they were going to hold. Next, we need to route the audio using the ProTools bus from our source tracks into the new bounce tracks. This amounts to setting the audio out for each source track to a unique stereo pair on the bus, and then setting the input for each bounce track to the corresponding bus pair. So with Adoré (which I’m starting to regret naming with that accent mark in it), the drums are sent out to Bus 1-2 and the Bounce Drums track is set to input 1-2, and so on down the line. This is a real pain to set up each one by hand and make sure they line up, but there turns out to be a shortcut that I discovered about halfway through the process. First, select all of your source tracks (and only those). Then hold down Ctrl+Alt+Shift and click on the output bar of the first source track in the mix window and select Bus 1-2. All other selected tracks will automatically be assigned to Bus 3-4, Bus 5-6, and so on down the line. Repeat this process to set the inputs to your bounce tracks. So long as they’re in the same order, everything will line up automatically. It’s pretty awesome. Next, we need to arm all of our bounce tracks to record. Again, there’s a nice shortcut here. Select all of the bounce tracks, then hold down Alt+Shift and click on the record button for any of them. This will arm all selected tracks at once, and you’re good. Finally, make sure the song is rewound to the beginning and hit record and play. If everything’s set up correctly, the audio from all of your source tracks should now be emptying itself into the bounce tracks and you’ll have clean copies of all of your audio, effects and automation and all. After recording completes, don’t forget to set the output of your audio tracks back to the main interface output and mute all of your bounce tracks. You can use the same Alt+Shift trick here, too. Now of course I do have the final mix of this song, and I obviously still have the project file, so why go through all this work? Especially considering that digital audio doesn’t degrade like old analogue tapes would, right? Well, here’s the thing that I found out the hard way. Digital recordings can in fact degrade, but not in the same way. With digital systems, master tracks are no longer just straight recordings of what somebody played at some time. Take Mettle here, for instance. It was recorded entirely with software instruments, meaning I had no audio for any of the parts except for what was exported in the final mix. If any of these plugins had stopped working, I wouldn’t be able to go back and do anything interesting with Mettle again, like remixes or mashups or inclusion into a music game. Software changes, computer upgrades, file system shuffles, and other things can all lead to difficulties. For example, I had sampled a software-modeled Roland TR-808 drum machine ages ago and had used those bits in lots of places. However, in the intervening years since I made those recordings I have no idea what happened to those files. I still had the drum machine sequence, but no sounds to put in it. This effectively meant that unless I found or replaced those sound files, the drum tracks to several songs would be lost forever. Several plugins that I used heavily on earlier albums under WinXP no longer run very nicely on Win7, which meant I was very close to losing the exact sound that I had carved out for each part of these songs. I spent a lot of time getting legacy software to run just to make this work. Since I’m looking to upgrade my whole setup this summer, I wanted to take some steps to make sure I had things taken care of first. Bouncing out to individual tracks gives you a flexibility and a certain amount of future-proofing that you wouldn’t have otherwise. Thus far, I’ve managed to bounce out the three main Psycliq albums and am now working on the covers and Christmas tracks. Even though going back over some old music has made me cringe at every mistake and slip, it’s been well worth it. I hope that everyone had and/or is having a wonderful holiday season! Have you downloaded Light The Tree yet? It’s only going to be up for another week, and it’s completely free! My holiday has been filled with a lot of driving around to family events, but now I think we’re finally settled into the house for a bit. Exhausting, yes, but lots of fun, with a brand new year that’s almost begun. And what did I find under the tree this year? Why, nothing short of a new piece of gear! OK, this rhyming has to stop. (Anybody got a mop?) Seriously. 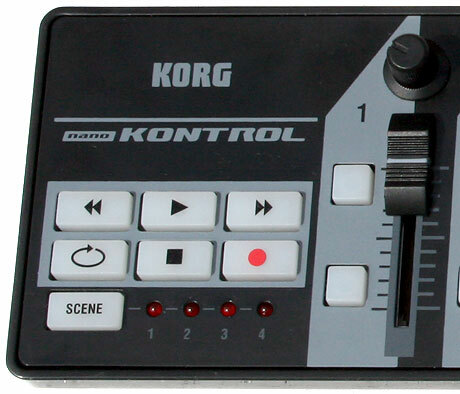 What you’re looking at in the product shot (courtesy of a fine review from SKRATCHWORX) is a Korg NanoKontrol. This lovely (and tiny) piece of hardware is really just a USB MIDI controller with a bunch of sliders and knobs and buttons on it. Nothing fancy on its own, but when you pair it with the right software you’ve got a pretty powerful setup on your hands. The obvious use case for me is for a mixing board, controlling track volumes and plugin controls in ProTools. With nine independent sliders, each with a knob and pair of buttons, you’ve got some really nice physical control over the mixing process. Since ProTools is notoriously picky about non-Avid-owned hardware, it sadly didn’t work out of the box. However, there is hope! You see, with its included editor software, this little guy can spit out pretty much whatever MIDI control codes you want it to, thereby pretending to be basically any kind of control surface out there. I used a great little tutorial to wire it up into ProTools, and I was very quickly in business. The first eight sliders map to the volume control on the first eight channels, and the last slider maps to the volume control of the last master fader. In other words, it does exactly what you’d expect it to do. In fact, I was a bit amazed at how smoothly everything worked. I will likely be tweaking the control mappings going forward, but this is a fantastic starting point, and I’d like to thank the folks at Trikome for their setup. One of the main reasons for loving it so much has got to be the hardware transport controls. The ability to start, stop, rewind, and record from dedicated buttons cannot be beat. This way, I don’t have to fumble over to my computer keyboard to mash the right arcane button combination just to get things to start and stop when I want them to. 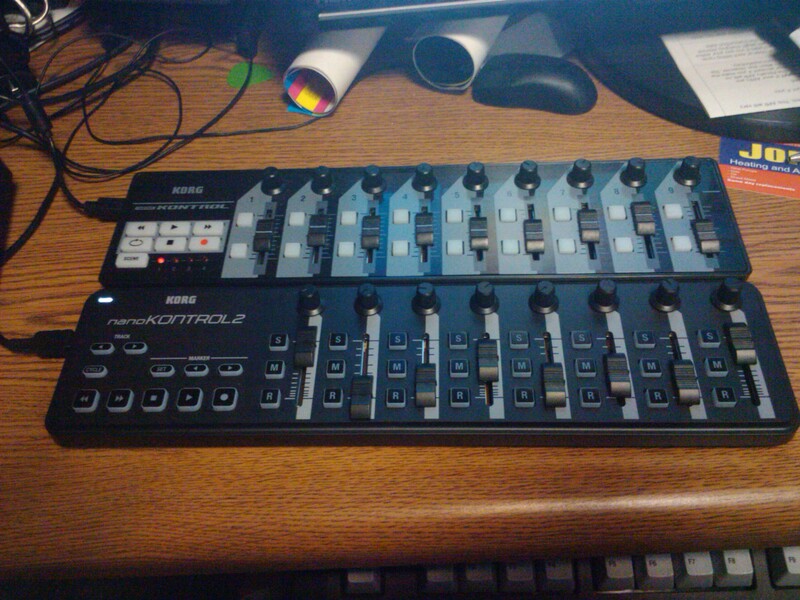 Mind you, the NanoKontrol doesn’t do any recording or mixing on its own — it is nothing more than a simple MIDI device. But like all good tools, it’s in exactly the form factor it needs to be in to make it useful. I’m going to need to rearrange my desk a bit to accommodate it, but I really needed to rework the studio space anyway. Maybe that’s something we can look forward to in the new year. Just got an express package in the mail: a new printing of Results Not Typical. This one comes from createspace. Same music, bit different packaging, and these are print on demand and should be available through Amazon. I think I’ll be using these guys for the forseeable future. Somehow, I’m finding a decent amount of time to work on this album. I’ve been able to track two more songs in the past two days. And what’s more amazing to me is that they’re nearly done in their current state. The aesthetic for this album is going to be a lot more sparse than I’m used to working with. There are songs on here that are a solo piano with nothing else involved. These last two are piano with a simple synth pad of some kind underneath them. Sure, there are more complex songs with multiple layers of guitars and all kinds of effects and stuff like that, but even those are a lot more raw than the norm. But I’m very happy with how it’s coming out, even though I’m also wanting to be done with this set of things so I can put some work into other stuff. Titles for songs have always been fairly important to me. However, most of what I come up with is simply Too Clever for its Own Good. Which, incidentally, I’ve decided is going to be the title of my autobiography/memoir. But take for example “This Town Loves You, This Town Will Destroy You” off of halt. I like the title a lot here, it’s catchy and I felt it matched the two-part nature of the song. Problem is that the song itself isn’t as good as its title, in my opinion. You expect this epic tale of woe, but you get this noodly thing. It’s one of the most clicked-on tracks in the bandcamp page, which tells you that the title is grabbing people’s attention. But “Adoré”, what I consider to be the best track on the album, doesn’t get as much attention. The title is a much better fit for the song here, though. And now the part that some of you have figured out was coming. I’ve told you that I have a lot of songs for Results Not Typical, and I told you that titles are important to me. Now I tell you the titles of the songs! At least, these are the probably-final titles from the most-likely-going-to-keep tracks for the album. There will be other songs, too, but I’m either not happy enough with the title yet or I’m not sure the song’s going to be good enough to make it on. These are also the ones I’m pretty sure I’ll be able to finish. Presented alphabetically so as not to imply any kind of album ordering. I’m currently borrowing a KORG Wavedrum from a friend of mine. For those unfamiliar with this fantastic instrument, it is an acoustic drum synthesizer. It works by using vibration sensors underneath a real drum head and rim that respond to all of the dynamic playing that a hand drum is used to, and then sending those signals to a synthesis engine. The engine then takes the input waves and modulates them with various PCM sources and algorithmic sound models to create the output. What all of that technobabble really means is that this isn’t a drum, it’s a thousand drums in one box. And unlike a drum machine or normal synthesizer, it is played like a real acoustic drum would be. In short, it’s pretty awesome. I’ve only had it at my place for a few days now, but I’ve managed to spend a few sessions just playing with it. It has an impressive range of tones, most of which mimic real drums of various flavors in addition to a bunch of very otherworldly sounds that have very little to do with drums. However, the fact that you play these sounds like a drum adds a rhythmic character to it. Another great feature of this instrument is that it outputs directly into the recording system. This means that any incidental ambient noises won’t bleed over into the recording. As you’ll recall, this was a necessary feature for my acoustic guitar as well. It turns out that a home studio is difficult to run with a 10-month old in the house. Incidental ambient noises are the rule of the day. After my initial noodling, I set about using the Wavedrum on an actual song. This one has a bluesy little groove to it that my traditional drum machine just wasn’t going to capture. I tried to program it in Reason, but the timing was all off and it felt horrible. Ever wonder why so many techno songs are in straight 4/4? It’s because it’s really easy to program that. I’ve programmed a few different step sequencers before, and they’ve all been 16-step 4/4 sequencers. The Wavedrum, based entirely on hand input, has no sense of quantization. Thus, I quickly found out something I knew already — that I am not a very good drummer. I’ve got a decent sense of rhythm, but translating that into a particular instrument isn’t always so straightforward. Thankfully, modern post-production lets me tweak things in software where needed. That said, I am trying to have a fairly light touch on this. In any case, I jumped in and tried a few different drum sounds before settling on a nice round conga sound. With a little compression, it gave me a nice snappy sound that complemented the acoustic guitar and bass that drives the rest of the song. The Wavedrum, being a very different kind of sequencer, turns out to be quite difficult to program. I wasn’t getting the deep booming tones that I was after for underlying the higher accents, so I ended up breaking out the drum machine for just those bits. After trying unsuccessfully to sync with the underlying groove, I simply recorded the drum machine output to a track and un-quantized it by hand to match. This is the opposite of what you usually do with drums. After a few sessions of recording, re-recording, and tweaking, I’m getting relatively happy with the state of the song. I have a vision of some kind of bell over the top of it, or something to that effect, but I’m not sure it needs it. I always have trouble knowing when to stop. Oh yes, the title? “By Pint and Pound”. Now you have the first title of a song from Results Not Typical. Originally the title was “Blood and Flesh by Pint and Pound”, I thought it was a little too macabre. What do you think though? Should I change it back or keep the shorter version? Maybe you’d have to hear it first. Maybe I can arrange that, if you want.